The week... the American Petroleum Institute, the largest oil and gas lobbying group in Washington, announced the launch of a program aimed at reducing emissions of methane from oil and natural gas production. "The program overall is set up to continuously improve the environmental performance for onshore operators throughout the country through the process of learning, collaborating and taking action," said Erik Milito, director of upstream and industry operations for API. "This is a very robust program." However, some environmental groups called the initiative, titled The Environmental Partnership, too little, too late given the industry’s embrace of Trump’s deregulatory agenda. “It’s somewhat amazing that the industry hasn’t already put forward its own standard,” said Chase Huntley, director of energy and climate at The Wilderness Society. Oil and gas firms participating in the program, which includes heavyweights like Chevron, BP, Royal Dutch Shell and ExxonMobil onshore subsidiary XTO Energy, have agreed to cut pollution by monitoring and repairing leaks and replacing or retrofitting “high-bleed” pneumatic controllers, identified by the Environmental Protection Agency as a top spot for the release of methane. "It's a very targeted, surgical approach," Milito said. Methane is between 28 and 36 times more effective than carbon dioxide at warming the atmosphere over a 100-year time period, according to the EPA. The measures are also meant to curb the release of volatile organic compounds, which can act as a precursor to ground-level ozone, a component of smog linked to heart and lung problems. The voluntary program, in which 23 of the top 40 U.S. natural gas producers by volume are participating, focuses on the process of producing natural gas, not the final product — that is, not on the amount of methane actually released into the atmosphere. Under the program, API will publicly report on its progress, with the first report coming in 2019. Energy firms have a financial incentive to work together, as they are under this program, to capture as much methane as possible. Because methane is the main component of natural gas and can be burned for fuel, every molecule of methane emitted is lost energy — and lost revenue. The Obama administration, through rules issued by the EPA and the Interior Department, attempted to rein in methane emissions. But Trump has put both agencies’ policies under review, a move API and other industry players welcomed. For example, the Bureau of Land Management, finalized a rule in late 2016 designed to curb the practice on public lands of venting and flaring — or burning off some gas as it arises from a natural gas well — that the new API program leaves unaddressed. After Congress narrowly voted against repealing the BLM rule, Interior decided to take action itself. On Friday, Interior will formally announce a two-year delay in the implementation of that rule, according to a Federal Register filing. “We suspect the timing is not coincidental with the administration’s next step of seeking to significantly revise the rule,” Huntley said of API’s announcement. The launch of API’s program follows a similar announcement earlier this month by eight large oil firms, including Exxon, BP and Shell, that they would significantly shrink the amount of methane emitted across the natural gas supply chain. “For years, many in industry have argued against government action to address their climate impact, touting voluntary corporate pollution reductions as a substitute for regulations,” Environmental Defense Fund, an environmental group that helped those firms develop that plan, wrote in a blog post. EDF says there is one important difference between the two initiatives: Their plan emphasizes that “regulations are needed," while API's does not. "We're looking at this outside of the regulatory scope," API's Milito said. The divide: Compliance with regulations is more costly for independent operators extracting gas domestically than it is for multinationals like Exxon, BP and Shell. In general, while industry giants may prefer watered-down rules, smaller players are more likely to favor little to no regulation at all. 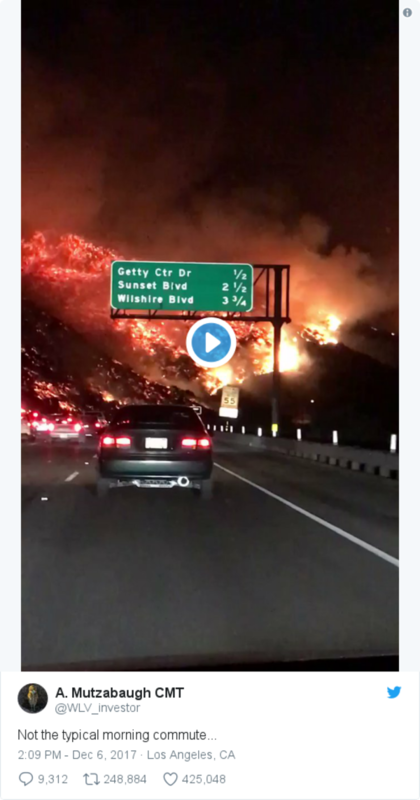 -- Southern California is on fire: The blazes continued as wildfires in the Los Angeles and Ventura counties destroyed at least 100,000 acres and forced tens of thousands to flee their homes. 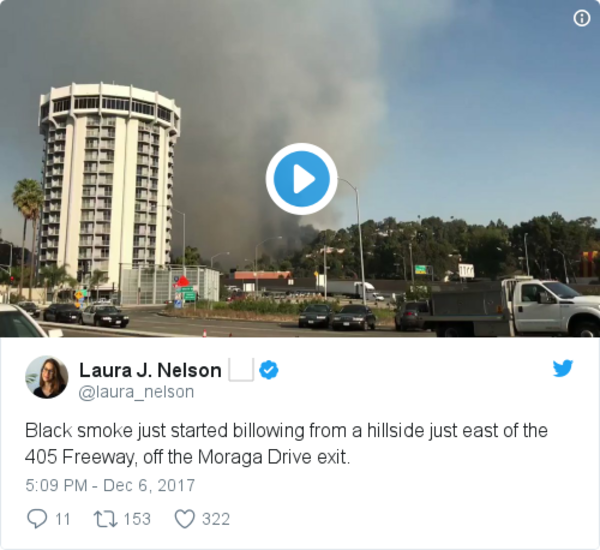 A new blaze, dubbed the Skirball Fire, erupted Wednesday morning in Bel Air, requiring the closure of parts of I-405, one of the country’s busiest freeways, and forcing the evacuation of 1,200 homes, reports The Post’s Scott Wilson, Mark Berman and Eli Rosenberg. The Thomas Fire in Ventura County had burned 90,000 acres by Wednesday, with 50,000 people evacuating from 15,000 homes. 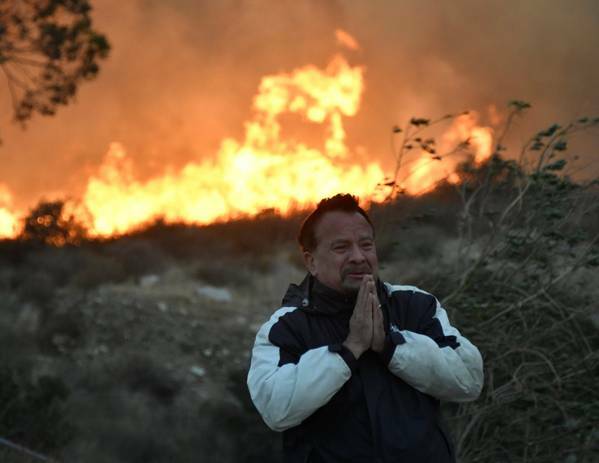 By Thursday morning, officials said that blaze had surrounded the popular winter retreat of Ojai. Most of the Ojai Valley, which has about 8,000 residents, was under a mandatory evacuation order, WIlson, Berman and Rosenberg report. A number of areas east of Santa Paula, Calif. were also placed under mandatory evacuation late Wednesday. 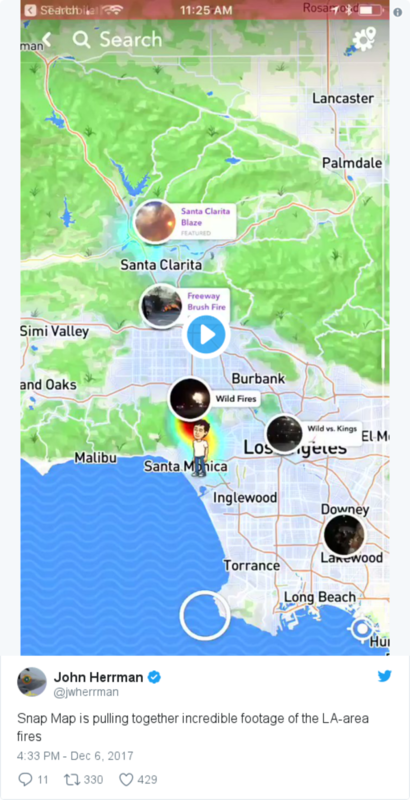 In Los Angeles County, two relatively smaller fires, the Rye and Creek Fires, had burned through more than 18,000 acres combined by Wednesday, according to the Los Angeles Times. California Gov. 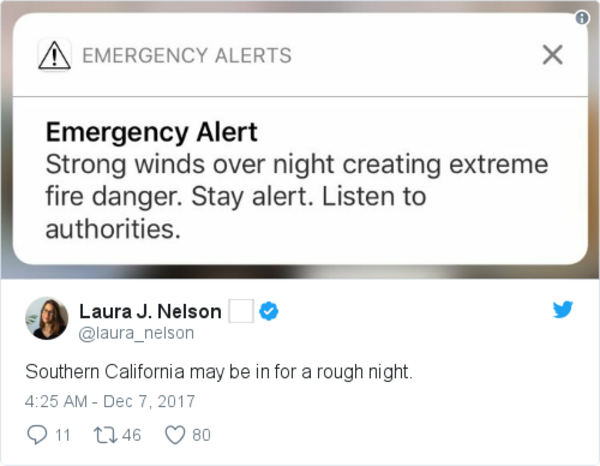 Jerry Brown (D) declared states of emergency in both affected counties. 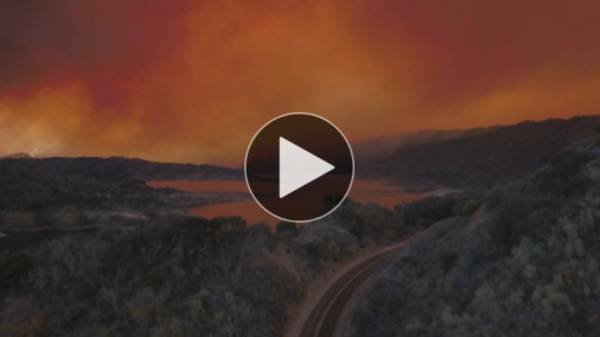 More than 4,000 firefighters were dispatched across the region, The Post reports. 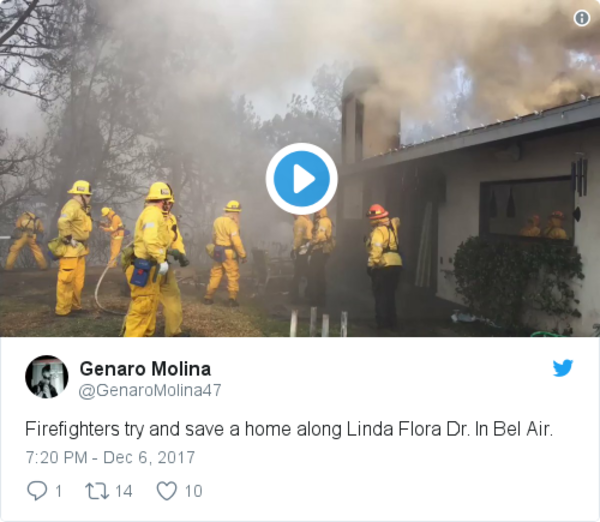 Many of those first responders had not yet slept since the blazes erupted Monday, Los Angeles Country Fire Department Chief Daryl L. Osby said. No deaths have yet been reported yet, though not all burned areas are accessible. But officials have warned the wildfire threat could continue and increase through the rest of the week. On Wednesday, Los Angeles officials said they were expecting another night of winds as high as 80 mph. The Post's J. Freedom du Lac gathers some other stunning visuals of the devastation here. 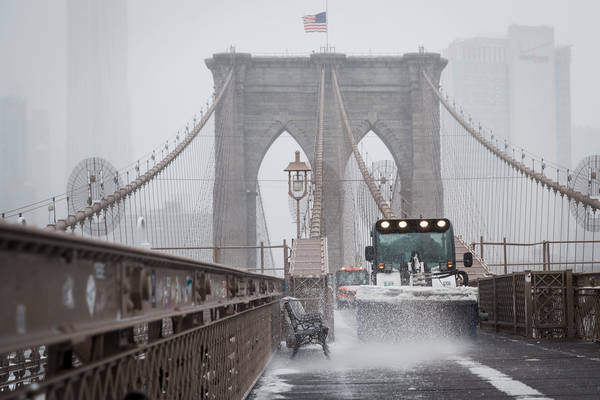 -- The extreme weather conditions currently gripping both U.S. coasts may be connected: The fires raging in Southern California and the frigid cold forthcoming in the eastern United States are the result of extreme jet patterns that can make the West hot and dry while making the East cold, Capital Weather Gang’s Jason Samenow reports. And climate change might be to blame. -- Predicting the worst-case scenarios: The climate change simulations that most accurately depict current conditions are also the ones that also forecast the most alarming levels of human-driven global warming, The Post’s Chris Mooney reports. A new study released in the journal Nature assessed models used to map out future conditions, and then examined their specific predictions. “Those models generally predicated a higher level of warming than models that did not capture those conditions as well,” Mooney writes. Put another way, the models that best captured what the authors called the Earth’s “energy imbalance” were also the models that predicted more warming in the planet’s future. The report is the latest in the growing list of dire forecasts about the warming climate, he adds. But several scientists consulted by The Post warned that the research is not yet definitive. 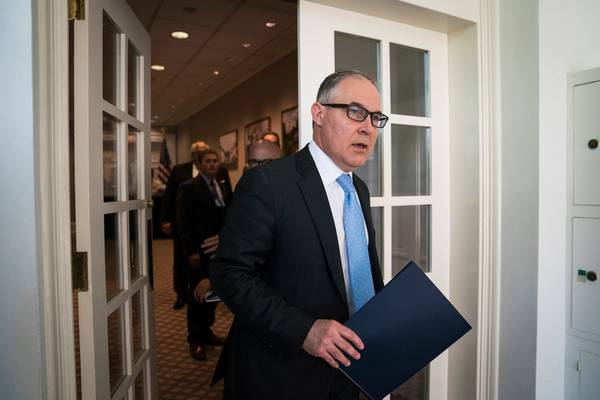 -- It won't happen again: EPA scientists will now be able to speak freely about their work, agency head Scott Pruitt told lawmakers. In a letter to Sen. Sheldon Whitehouse (D-R.I.), Pruitt responded to inquiries about why the EPA prevented two scientists and a consultant from speaking at a conference in October, the New York Times’s Lisa Friedman reports. Read Pruitt’s full letter here via the New York Times. 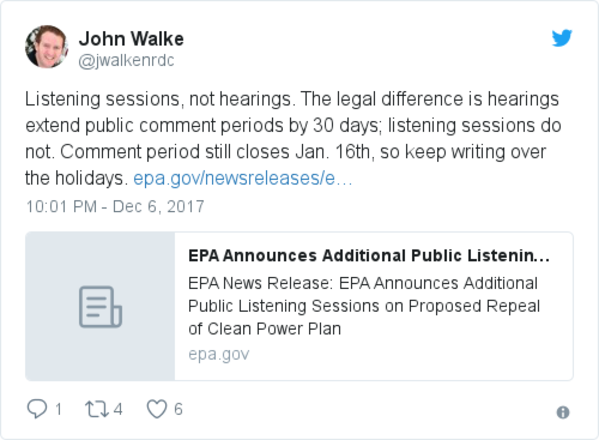 -- EPA expects even more of an earful about Clean Power Plan repeal: The EPA announced Wednesday it plans to hold additional "listening sessions" on the proposed withdrawal from the Obama Clean Power Plan after holding two days of hearings in West Virginia last week. “Due to the overwhelming response to our West Virginia hearing, we are announcing additional opportunities for the public to voice their views to the Agency,” Pruitt said in the statement. Three additional sessions will be held in San Francisco, Gillette, Wyo., and Kansas City, Mo., though dates have not yet been announced. “The Trump Administration and Administrator Pruitt continue to thumb their noses at Congress – defying any real attempts for Congressional oversight," Pallone said in a Wednesday statement. "It is outrageous enough that Mr. Pruitt is testifying before Congress for the first time since becoming Administrator, and now that outrage is taken to another level by the Administrator needing to leave after a mere one hour of testimony." -- EPA IG investigates Pruitt: The EPA’s internal watchdog plans to investigate Pruitt’s meeting with a mining group in April. House Energy and Commerce Committee Democrats shared a letter on Wednesday announcing the decision from the EPA’s inspector general. “We will review the single meeting between EPA Administrator Pruitt and the National Mining Association in April 2017 that you identified in your letter to me. 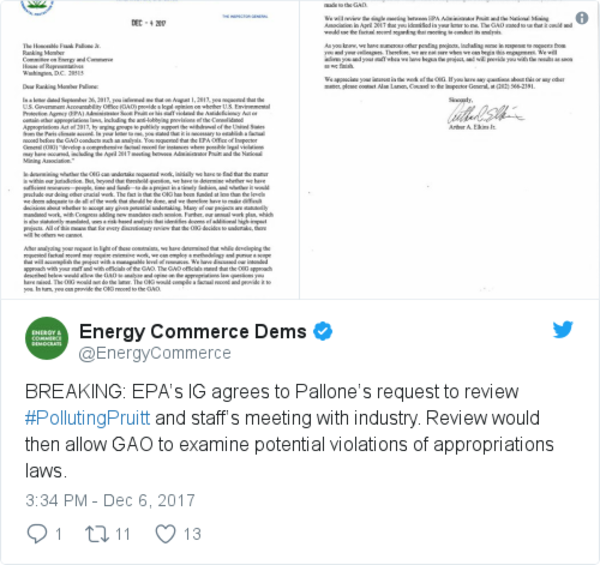 The GAO stated to us that it could and would use the factual record regarding that meeting to conduct its analysis,” read the letter from Inspector General Arthur A. Elkins Jr.
An EPA spokeswoman told The Hill’s Devin Henry that the investigation is “merely an announcement that the OIG will begin work on a fact-based report." -- Monumental fight: Outdoor retailer Patagonia joined a growing list of lawsuits against President Trump following his announcement about a plan to drastically cut the size of the Bears Ears and Grand Staircase-Escalante monuments in Utah. The California-based company filed the suit on behalf of a group of organizations looking to block changes to the Bears Ears monument and charged that the move exceeds the president’s authority, reports the Associated Press. On Monday, the company’s founder signaled his intention to sue the president over his decision to shrink the monument. "I'm going to sue him," Yvon Chouinard, the company’s founder told CNN. 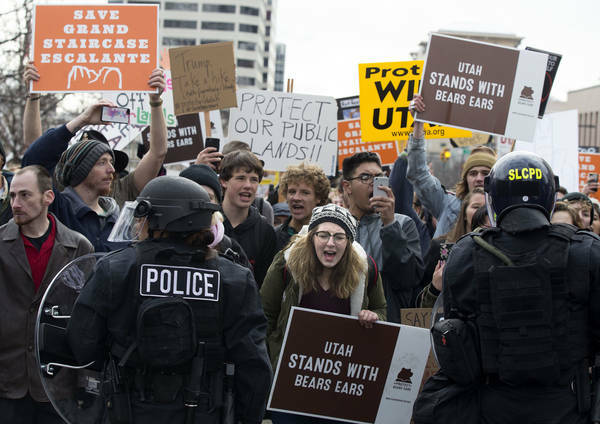 The Natural Resources Defense Council and the Southern Utah Wilderness Alliance, along with with Earthjustice on behalf of nine other groups, also filed lawsuit to block the Bears Ears decision. Those three groups were already part of a coalition suing over Grand Staircase-Escalante. The Energy 202 explains the legal fight over both monuments here. -- "A difficult position to defend:" Former President Barack Obama praised mayors, and other civic leaders for being the “new face of American leadership on climate change." His remarks came at a summit where the nation’s mayors signed the “Chicago Climate Charter,” pledging to continue working to reducing emissions as outlined in the Paris climate accord. 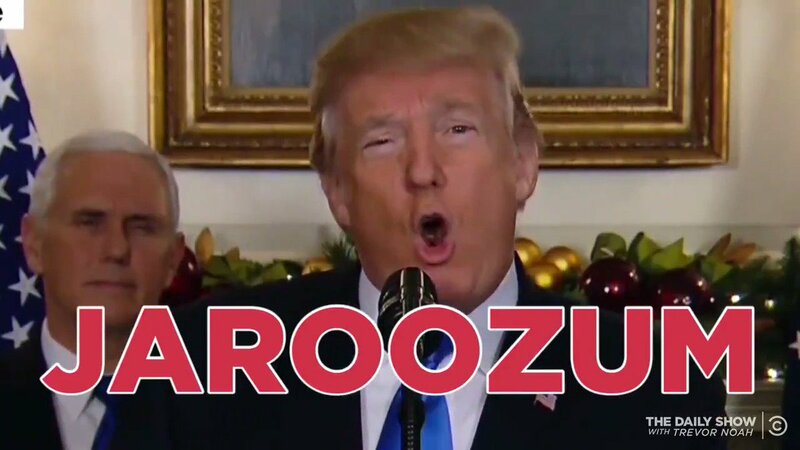 Though he didn't mention Trump by name, Obama took a swipe at the president's decision to withdraw from the accord. -- “Good to go:” Just as President Trump was delivering his address on Inauguration Day, his then-National Security Adviser Michael T. Flynn sent a text to an ex-business associate saying a plan to work with Russia to build nuclear power plants in the Middle East was “good to go,” a whistleblower told Congressional investigators. The Post’s Tom Hamburger reports Flynn told his associate that U.S. sanctions against Russia would be “ripped up” by the Trump administration in order to help move the nuclear plant plan forward, the associate told the witness. The whistleblower’s account was detailed in a letter Rep. Elijah E. Cummings (Md. ), the top Democrat on the House Oversight and Government Reform Committee, sent to the panel’s chairman Rep. Trey Gowdy (R- S.C). In the letter, Cummings urged Gowdy to subpoena the White House for documents on Flynn, adding that the panel has “credible allegations” that Flynn “sought to manipulate the course of international nuclear policy for the financial gain of his former business partners,” Hamburger reports. -- At risk: An area of protected land totaling 120 million acres, larger than the state of California, may be at risk from being opened to oil and gas drilling, a new analysis from Unearthed, a publication from Greenpeace reported. 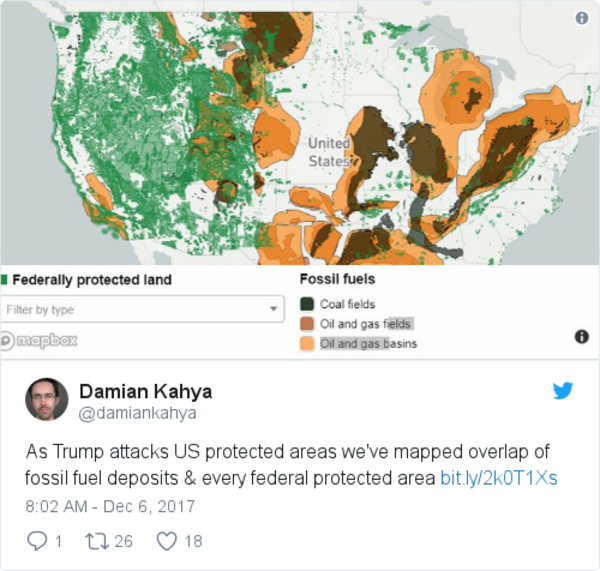 The publication says that “some highly protected areas may simply see rules around existing drilling weakened, or more drilling taking place on the borders of the parks.” Unearthed mapped protected parks that overlap with potential oil, gas and coal reserves, and listed that some of the sites potentially at risk include Gunnison national forest in Colorado, the Dakota Prairie Grasslands in north Dakota, Canyonlands National Park and Zion National Park in Utah and Alaska’s Arctic National Wildlife Refuge. “[T]he Secretary has stated multiple times on the record he is not interested in drilling in national parks. I suggest you do more through [sic] research,” she said in a statement to Unearthed. The state's Democratic attorney general slammed the EPA Wednesday, accusing the agency of insufficient transparency and policies that hurt the state under Trump. It’s one of the dirtiest places in America. Former residents of Tar Creek, Oklahoma, want to know why Trump’s EPA chief didn’t prosecute allegations of wrongdoing during a federal buyout program. A Volkswagen AG compliance executive who pleaded guilty in the U.S. for his role in the company’s $30 billion emissions cheating scandal was sentenced to 7 years in prison. General Electric plans to cut as many as 4,500 jobs in Europe as the U.S. industrial conglomerate shrinks its troubled power generation business, a labor union source said on Tuesday. EPA head Scott Pruitt testifies at a House Energy and Commerce Subcommittee on Environment hearing. The Center for Strategic and International Studies will host the launch of OPEC’s World Oil Outlook 2017. The House Energy and Commerce Subcommittee on Oversight and Investigations holds a hearing on “Examining the Role of the Department of Energy in Energy Sector Cybersecurity” on Friday. The NCAC holds a presentation on U.S. oil and natural gas on Friday. President Trump claims GDP would be higher "without the hurricanes:"
The Daily Show with Trevor Noah compiles "Trump's Best Words of 2017:"
Energy & environmental reporter for @washingtonpost and newsletter writer for @PowerPost.